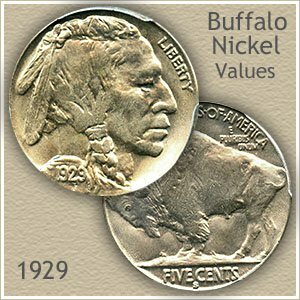 Today the 1929 nickel value begins at 85 cents each. The price is for a heavily worn coin, in what is known as "Good" condition. The latter years of Buffalo nickels begin to show a lowering of minimum values. However production at the Denver and San Francisco mints was far less than Philadelphia. 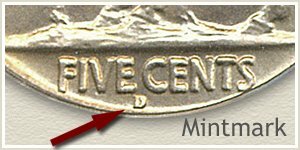 Look first for branch mint coins, identified by an "S" or "D" as they are highly valued by collectors, often worth twice the Philadelphia nickel. Any buffalo nickel, with a readable date and either a "D" or "S" mintmark is in demand. 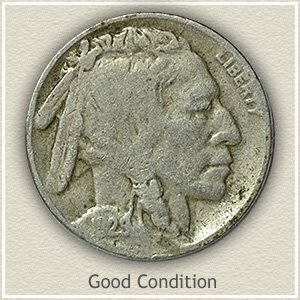 Along with mintmarks and dates, the condition of your old nickel must be considered, it drives 1929 nickel value higher. Is your coin heavily worn and only part of the date shows, or is it well defined and sharp in appearance? The difference in how much your Buffalo nickel is worth is often surprising. A 1929-D ranges in value from 90 cents to over $44 and higher depending on condition. Of the three mints that produced Buffalo nickels, the 1929 "D" is the one you are hoping to find. A small "D" located on the reverse indicates the coin was minted in Denver. The next in value is the San Francisco mint coin identified by an "S". And very similar to the "S" in value is the Philadelphia mint issue, it does not have a mintmark. 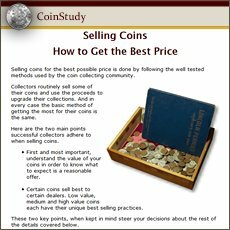 Major coin auctions attract the highest quality coins and present them to the highest quality bidders. The above are all respected leaders in the industry that produce results. Here is the outcome of one superior 1929 nickel at auction. 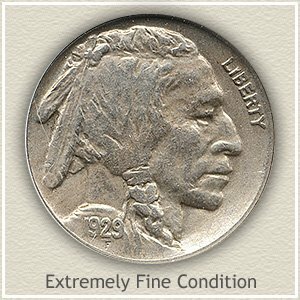 With eye catching light maroon toning fading to violet at the rims it required a final price of $632 at a Heritage Auction for one serious collector to take home a Gem condition 1929-S nickel. A high quality coin selling in a high quality auction resulted in high 1929 nickel value. 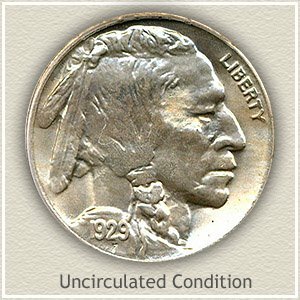 Uncirculated: A 1929 buffalo nickel in this condition stands out as a superior coin. It never circulated, therefore its surfaces show no signs of wear. Handle coins in Uncirculated condition by their edges to preserve their value. Rotate the coin under a light, examine the cheek of the Indian and upper back of the buffalo for signs of wear, appearing as dullness on the high spots. 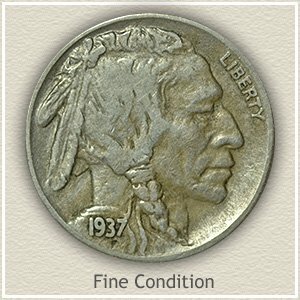 Fine: Also a collectible grade for a 1929 nickel, the coin has a pleasing but worn appearance. A full bold date with legends separated from the rims, increases this grade from a lesser one. Ample design details are visible on both the Buffalo and Indian. Good: Buffalo nickels have such a bold design that even in Good condition they are pleasing. Wear however has lowered the rim to the point it begins to touch the tops of the lettering on both the obverse and reverse and the date is faint but readable. Including more relating to your 1929 nickel value. Easily find how much your old coins are worth. 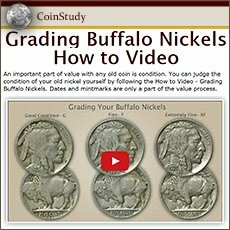 Coin Values Discovery... finds the 1929 nickel value and... all old US coin values. It is an excellent index with images and text links to all coin series, from Cents to Gold. Value charts, grading images and descriptions uncover how much your box of old coins is worth.